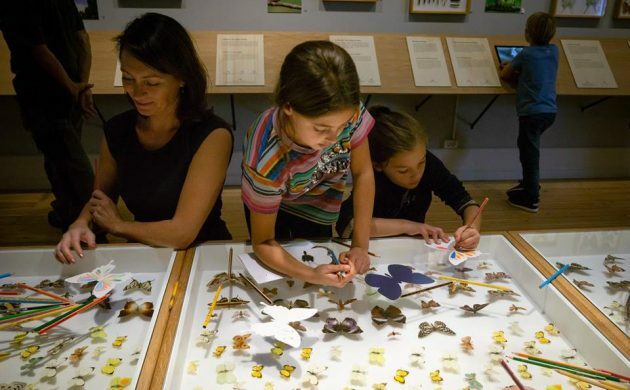 Statens Naturhistoriske Museum is busy making a butterfly database that it hopes will include 2 million specimens once completed and provide insights into how nature has evolved – particularly in relation to climate change. In collaboration with the University of Copenhagen, to which it is affiliated, it is appealing to volunteers to help digitalise the images and data found on labels attached to butterfly specimens that have been gathered from all over the world since the late 18th century. Just 2 percent of the natural history museum’s collections are currently digitalised. The choice to digitalise the butterflies before other specimens was not made randomly. “Butterflies are sensitive to the smallest environmental changes,” explained associate professor Thomas Pape to ku.dk. Once completed, the database will be free to access via the internet. In total, the museum houses 14 million objects – a collection that would stretch from Copenhagen to Holbæk if displayed on a shelf. Meanwhile, an exhibition including some of the museum’s butterfly specimens opened last Friday. Two internet providers, SEAS-NVE and NRGi, are confident they can radically improve the internet coverage provided to people living in Region Zealand, where it is perceived that only 40 percent of homes have a high-speed connection, compared to a national average of 62 percent. Some 4.6 billion kroner of public money will be spent by SEAS-NVE (3.4) and NRGi (1.2) on the installation of fiber networks in the region in a bid to give the majority of homes a connection speed of one gigabit per second, including at least half of all residents living in notorious low-speed areas such as south and west Zealand, Lolland-Falster and the islands to the south of Zealand. The turnout at Denmark’s green summit in Copenhagen on October 19 and 20 is shaping up nicely, according to the minister for development, Ulla Tørnæs. More heads of state – including Dutch PM Mark Rutte, South Korean President Moon Jae-in and Vietnamese PM Nguyễn Xuân Phúc – will be attending the P4G Copenhagen Summit than expected, along with a large number of delegates representing more than 50 countries. Alongside the politicians, company executives, civil society representatives, investors and entrepreneurs are expected to gather to discuss pressing matters concerning the environment. While Friday’s summit will take place at a number of venues, including Dansk Industri (opening session) and City Hall (evening networking event), all of Saturday’s events will take place at DR Koncerthuset. Danish biotech company Biophero has received funding of 3 million euros to develop non-toxic biotechnology that could potentially replace pesticides and not be harmful to groundwater, reports Ingeniøren. The biotech uses pheromones to confuse male insects looking to mate. Biophero chief executive Christian Ebbensgaard told Ingeniøren it was important to compete with pesticides on price or the farmers would be unlikely to use them. Biophero was founded by two former DTU students, Irina Borodina and Carina Holkenbrink, and developed in collaboration with DTU Biosustain and Lund University. Denmark has negotiated a takeover of the Greenland GPS Network (GNET), a network of 59 measurement stations in Greenland, from the US. The stations’ geodata play a vital role in assessing the rate and impact of climate change on the island. Denmark will take on the costs of running the stations, which were established around 10 years ago as part of a research project run by Ohio State University and DTU Space, and continue to share the data with the US. In 2016, GNET measurements helped prove that the icecaps melted at a 7 percent quicker rate than previous assumed between 2003 and 2013. A Danish nominee will discover on October 12 whether it has been awarded the 2018 Future Policy Award, a prize handed to agro-ecological initiatives advancing the transition to sustainable food and agriculture systems. Officially described as ‘Organic Action Plan for Denmark: Working together for more organics’, the Danish nominee face stiff opposition from initiatives in Brazil, Ecuador, India, the Philippines, Senegal and the US as well as the UN Environment – a shortlist of eight chosen from 51 nominations from 25 countries.